Ideal for business or private hire. These types of vehicles are very popular for private hire due to the fact that they can quite often be driven on a car licence (do check before renting). 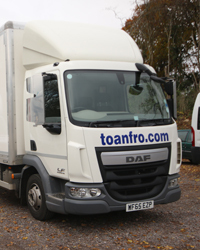 This is the perfect vehicle if you are moving house or from one business premises to another. The 7.5 ton has plenty of room for moving large quantities or bulky items. Lorry hire can work out to be far, far cheaper than paying for a removals company, especially if you feel that you want to be responsible for your possessions yourself. This vehicle is fitted with a taillift to allow easy loading and unloading of cargo. To drive this vehicle you must be licenced for category C1, usually automatic if you passed your category B (car test) before 1st January 1997. If you do not have category C1 included on your driving licence you will need to take an additional test to be legally allowed to drive a 7.5 ton cargo vehicle on UK public highways. N.B. You must be over 25 to hire this vehicle. If this vehicle is being hired for commercial purposes, then you will need to keep records of use including using the tachograph. If you are using it for personal use (such as moving house) then this is not necessary.